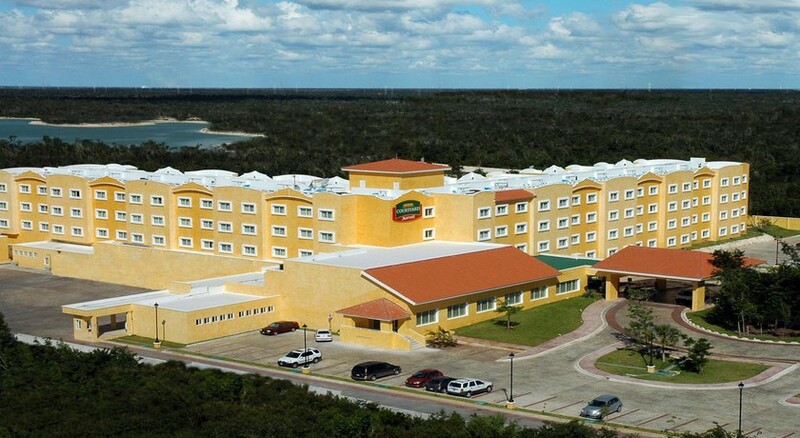 Situated in one of Mexico's most lively urban areas, the Courtyard by Marriott Cancun is close by to some of Cancun's most popular attractions, from the Mayan Ruins of Tulum to Playa Delfines beach. The hotel is a 5-minute drive from Cancun International Airport and offers a complimentary shuttle service to and from the airport. The hotel's guestrooms and suites are spacious, comfortable, and offer views of the gardens, pool and whirlpool with all the relevant amenities. Key facilities include a swimming pool and hot tubs, fitness centre, a peaceful garden with hammocks to lounge on, a free shuttle service to and from the beach club, plus a variety of things to see and do in the surrounding area. The dining options at Courtyard by Marriott Cancun includes the main buffet restaurant El Henequen, which serves traditional Mexican and International cuisine, plus a Lobby Bar – however, there are lots of food and drink options nearby in Downtown Cancun (a 10-minute drive away). 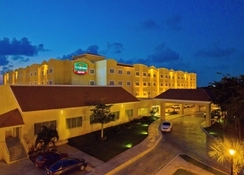 The hotel is located close to the Cancun International Airport at a distance of 6.5km. 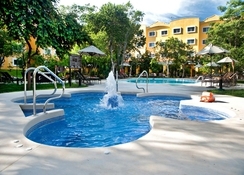 The hotel is also close to popular tourist attractions and the glittering white-sand beach. The nearest beach is Playa Coral, at 7.5km. Local attractions nearby are Mayan ruins, Wet 'n Wild waterpark (7km) and Punta Nizuc, Pok Ta Pok Golf Course (25km), Xcaret Park, Chichen Itza (23km) and more. Rooms at the hotel offer plush bedding, all modern amenities and airy interiors. For business travellers, the rooms at the hotel have well-lit and ergonomic workstations. 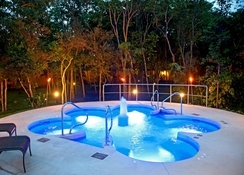 Rooms offer magnificent views of the gorgeous garden and the pool. Guests can choose between guest rooms with one king size bed with garden views or alternatively choose the same room type with two double beds. One-bedroom junior suites are also on offer, with one king size bed, a separate living room with a sofa. Start your day in Cancun with a delicious breakfast buffet at the El Henequen, which serves a mixture of Mexican and International cuisine. Also try the a la carte menu for lunch and dinner and get swept over by the rush of various tastes. The restaurant offers a true authentic dining experience to all its guests. For an assortment of alcoholic beverages, house wines and beers, with snacks and salad sides, guests can head out to the lobby bar. 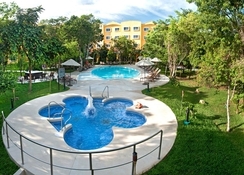 Your stay at Courtyard by Marriott Cancun can be as lively or laid-back as you wish. Guests can spend time at the state-of-the art fitness centre, relax in the solarium or lounge by the outdoor pool and whirlpool. 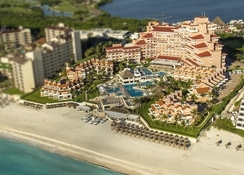 The hotel also offers a complimentary shuttle to and from the beach club at Omni Cancun Hotel & Villas.